Simple and creative, a sign is the perfect way to add a touch of fall to your home! Whether you have a knack for crafting or prefer to buy the perfect piece of wall art, there are plenty of options when it comes to choosing the right fall sign for you and your home. Fill your home with farmhouse-style fall quotes, colorful printables or a bold wood sign that makes a statement. 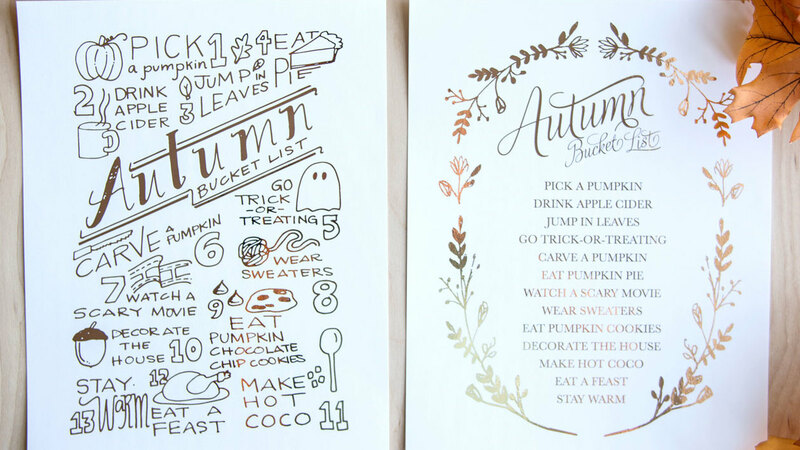 Get inspired to create your own festive sign or download the cutest fall printable by taking a look at these fall sign ideas rounded up by Porch.com. Transition your home for the fall season by decorating with these gorgeous watercolor printables that you can download instantly for free. Try framing them in plain white frames and placing them along your fireplace mantel or in your entryway. This handmade, weathered gray barn wood sign is just what your farmhouse-style home needs! Use it as inspiration for making your own DIY reclaimed wood sign or purchase it online to instantly and effortlessly add a rustic vibe to your home this fall. Go big this season by creating a large distressed sign that will greet guests with a warm, inviting feel. Follow this easy tutorial to DIY your own! Add a few pumpkins and festive blooms, and your fall front porch will be complete. Don’t let the season slip by without checking your favorite fall activities off the list! This free printable in two different styles is a delightful reminder to drink apple cider, pick a pumpkin, and stay warm this fall. Use up your old, chipped scrap wood pieces by repurposing them into cute fall harvest signs. DIY your own by following this step-by-step tutorial or purchase this fall sign to skip the crafting and go straight to decorating. Celebrate apple picking season with this adorable DIY apple chalkboard sign! With a wooden plaque, chalkboard paint, green felt and chalk, you can have this darling fall sign on your front steps within minutes. As we fall into October, pumpkin spice latte season is in full force! Dress up your home for fall by displaying this cozy chalkboard art featuring colorful leaves and pumpkins illustrations.